Want to start your own cleaning business? We show you how to do every aspect of the business, from start to finish. We've created the best selling online cleaning business start-up system. If you ever rode a bicycle with training wheels, you know that support kept you from falling on your face until you learned to ride on your own. The Clean Up Now System is the most advanced and complete business system yet developed for starting and running a cleaning business. 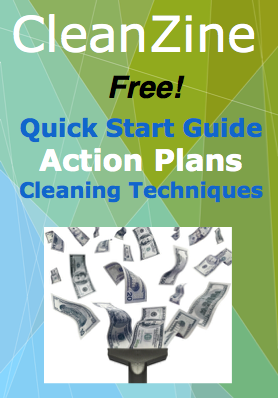 Included are advanced tactics and tools to start and grow your cleaning business. Over 150 tools & tactics are included! Learn as you go. Our proprietary business system makes it easy and fun! You don't have to possess any special technical skills or business education. You simply follow the step-by-step action plans and use the tools provided. We've included every tool and tactic you will need. More than 150 cutting-edge tools and proven business tactics. Already own a cleaning business? Do you already own and operate a cleaning service, and want to improve your overall business strategy, and increase your income? We've been in your shoes. We designed the Clean Up Now System for you too. We are dedicated to helping you grow richer and happier! Have a question for Evan?